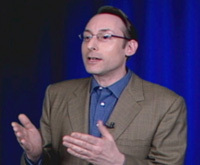 Evan Rosen, internationally-recognized collaboration and communication strategist and author of books including The Culture of Collaboration® and The Bounty Effect, delivers compelling keynotes and presentations on creating value through collaboration. Evan speaks globally at large-scale events, sales conferences, executive briefings, customer events, leadership forums, industry conferences, among many other venues. He has lectured at the Brookings Institution and the Stanford University Center for Professional Development, and he has briefed many senior leaders of Fortune 500 corporations and the highest levels of the United States government.